What is the (Next) Message? : Public Thesis Defence - You're Invited! The thesis has just officially passed committee and, after a final check-the-commas read-through, will be on its way to the external examiner. My external is Dr. Brenda Zimmerman from Schulich School of Business at York University, co-author of Getting to Maybe: How the world is changed. She is well-known for social innovation and complexity models of organization, and I am quite honoured to have her as my external. What do a social justice NGO, a New York City advertising agency, and a Japanese Zen philosopher have in common? 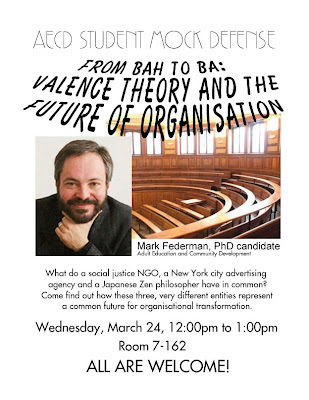 Come find out how these three, very different entities represent a common future for organizational transformation when Mark Federman publicly presents his doctoral thesis research in a department defence. If you are, or will be, in Toronto, it would be great if you could join in person. If you are not in Toronto, there will be a Skype conference call (max 23 people), with preference given to research participants who would like to listen in. Please email me with your Skype ID to reserve your Skype slot.